I don’t know much about art. I couldn’t tell an impressionist from an expressionist if my life depended on it. That being said, I love art and art museums, and I think viewing and talking about art is an incredibly valuable experience for a young child. I grew up near a wonderful art museum – The Detroit Institute of Arts – and I spent a lot of time there as a kid, mostly because they had fantastic children’s programs and admission was free. And, while I never did pick up on the myriad differences between impressionism and expressionism, I did spend hours upon hours browsing the collections and forming opinions about the paintings and statues. Some I adored, some I hated. Some stirred emotions, some left me cold. Even if I never picked up on the historical context of the collections or the art-world lingo, I definitely “experienced” the art, for lack of a better term, and I deeply enjoyed that experience. The great thing about spending time with art is that it helps teach you how to process abstract concepts. If you look at a painting and really ask yourself, “Why does this painting make me feel this way?” or “Why do I interpret the color red as anger?”, it can give you some amazing insights into how your brain works. And, when you talk about something as abstract as art, it helps you develop this vocabulary that, believe me, really comes in handy later in life when you’re struggling to talk about abstract concepts like pain, loss, joy, and love. So, yes, art is pretty and it’s nice to look at, but experiencing art isn’t just about aesthetics alone. That’s why I think exposing kids to art at a young age is a terrifically enriching activity and I just couldn’t encourage it more. But, I realize that talking about art isn’t easy, particularly when (like me) you don’t know much about it, and many families don’t have world-class, free-admission art institutes right down the street. 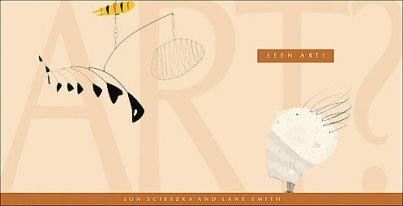 So, if you need help introducing your kid to the joys of art, here are six books that I think do an amazing job of helping kids grasp the illusive, abstract wonders of really appreciating both art and the creative process. 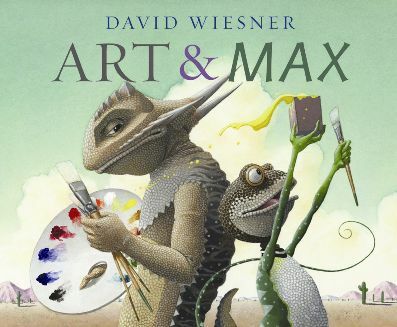 I once wrote that “David Wiesner is one of reigning Grand Poobahs the modern picture book and ANYTHING he publishes is totally worth your time.” I still stand by that statement and Wiesner‘s most recent picture book, Art & Max, is no exception. 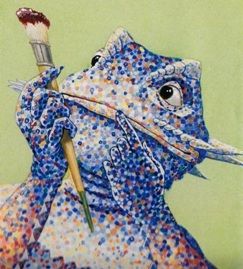 Across Wiesner’s gorgeous desert landscapes, we meet Arthur (or “Art”), a stately lizard who’s painting a very traditional portrait of a small red companion. Suddenly, the hyperactive lizard Max knocks into Art and declares “I can paint too, Arthur!” But Max doesn’t know what to paint. When Arthur suggests “you could paint me”, Max interprets this literally and starts splashing colors onto his exasperated friend. After Arthur screams in fury, the paint explodes off of him, leaving behind a vague color outline. This leads into a series of transformations where Arthur’s body evolves through several distinctly different art styles – pastels, watercolors, penciled outlines, Jackson Pollack-esque splatters, pointillism – his body is like a living history of art. 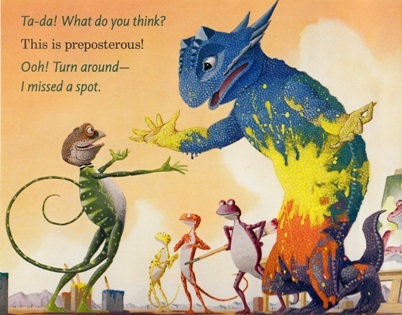 Max’s playful antagonism exposes Arthur to a whole new perspective on what art can be and, as the book ends, both lizards are attacking their new canvases with renewed vigor. But don’t let my references to Jackson Pollack and pointillism scare you off. First and foremost, Art & Max is a very, very fun picture book. My daughter always cackles as Max paints all over his best friend with wild abandon, and Art & Max is filled with some of the funniest physical humor I’ve seen in a picture book in ages. Who knew art could be this fun? This is an odd little picture book that my daughter adores. (Seen Art? might be one of our most frequently checked out books from the library.) To commemorate the opening of the new location of New York City’s Museum of Modern Art in late 2004, Scieszka and Smith created this long, thin tribute to the museum, in which a young boy, looking for his friend Arthur, gets directed into the new MoMA building after asking around, “Seen Art?” (Characters named “Art” or “Arthur” are a common recurring motif in kids’ picture books about art.) The boy eventually wanders through the museum – the book features a large series of wonderful reproductions of many of the museum’s most notable pieces – learning while he goes how other people define what exactly “art” is. The offbeat characters throughout the museum present to the young boy a fantastic series of questions regarding art – questions like “Is it trying to capture dreams? Or is it making images everyone can recognize?” And those questions have sparked some really fun conversations with my daughter. Seen Art? is a great overall primer for teaching kids how to appreciate and talk about art. And it’s the reason why my six year old can recognize an Andy Warhol or Roy Lichtenstein print on sight, which is pretty cool. Plus, when I was finally able to take her to MoMA this past summer, my daughter was over-the-moon excited and recognized her favorite pieces from the book on almost every floor of the museum, which was also pretty cool. 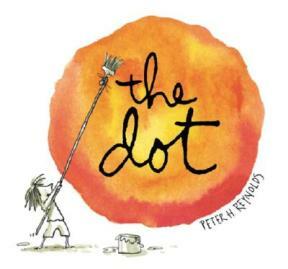 I wrote a long review of The Dot and Ish last year (which you can read here), but I couldn’t write an article about great art books for kids without bringing them up. 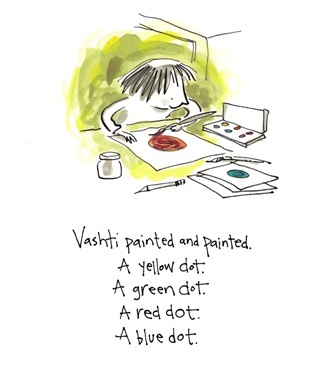 The Dot and Ish are two breathtaking picture books that focus less on art history and more on the creative process itself. Both books are about young children who feel anxious and insecure about their own artistic talents and, in both stories, the kids eventually learn to embrace and enjoy the experience of expressing themselves through art. 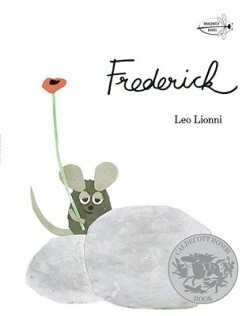 I have never, ever encountered a book that does a better job of explaining the importance and value of art and artists than Leo Lionni‘s Frederick. It takes all of these abstract concepts like art and emotion and, through the travails of these brilliant little collage mice, makes them easily understandable for young readers. In Frederick, a colony of farm mice spends the summer desperately gathering food for their long winter. 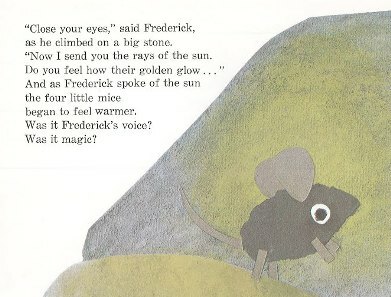 The only mouse who doesn’t seem to be helping is Frederick, a quiet, contemplative soul who tells his friends that he’s gathering colors and words to help the colony through the cold season. (“I gather sun rays for the cold dark winter days,” Frederick tells them.) Sure enough, during the harshest moments of the winter, Frederick’s friends turn to him and ask to see what he’s been harvesting. And, when the mice are at their most hopeless point, Frederick the poet uses his words to remind the mice of joy, happiness, and the colors of spring. He lifts their spirits and sustains them through their struggles in a way that food never could. This is a STAGGERING book with an amazing message, and it’s fun to read too. My daughter loves it. The concept behind James Mayhew‘s “Katie” picture books is one of those ideas that’s so brilliant that it seems odd that no one ever thought of it before. 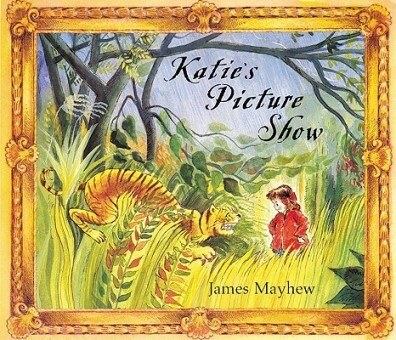 Starting with Katie’s Picture Show in 1989, Mayhew introduced Katie, a young precocious girl who finds herself able to step inside of paintings when she visits the museum with her grandmother. In her first adventure, Katie’s Picture Show, Katie tromps through the landscapes of such famous paintings as “Les Parapluies” by Renoir and “Tropical Storm with a Tiger” by Rousseau. 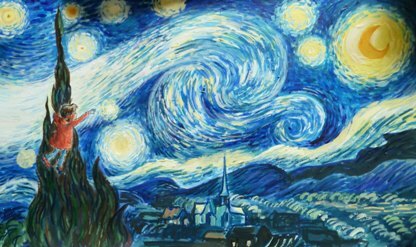 And, in her subsequent excursions to art galleries, Katie finds herself interacting with the “Mona Lisa”, Van Gogh’s “Sunflowers”, and many of Monet’s greatest masterpieces, among many other works. It’s just an inspired idea. Mayhew‘s Katie acts as an every-person, a surrogate for every kid who wishes they could just walk up to the Mona Lisa and ask what’s the deal with her smile. Katie jumps right into a painting and literally explores it like an anthropologist would. She notes details, she climbs the landscapes, she interacts with the characters – she turns artistic interpretation into more of an expedition than an academic exercise. That’s just a genius concept. With his “Katie” series, Mayhew appropriates some of the most iconic images in art history and transforms them into these marvelous visual playgrounds that kids can just dive right into. I can’t think of a better way to turn art appreciation into an interactive, immersive experience, and a whole generation of future art scholars probably owes Mayhew a huge debt of gratitude. Have I missed any particularly wonderful kids’ books about art? 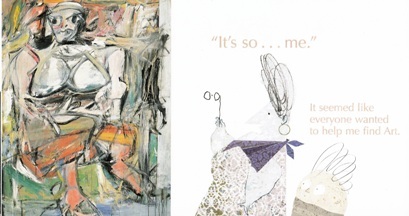 Do you have your own personal favorite title that you used to introduce art to your kids? If so, please mention it in the comments below. I’d love to hear about it. Beautiful Oops! by Barney Saltzberg isn’t really about art specifically, but about finding opportunities to be creative. It’s probably most appropriate for the preschool set. We picked up ‘Why is Blue Dog Blue’ when we lived in New Orleans (the artist/author George Rodrigue is from Louisiana and his art is found around the city and he has a gallery in the Quarter). I liked the idea of artistic license with color. Not just about art, I bought ‘A Tale of Two Williams’ before we went to the Met when my son was 4.5. It excitement my son had reminds me of your daughter’s at MOMA. The book is older, and so the color of the photographs has that 70’s feel, but it’s still magical. We’ve also enjoyed Babar’s Museum of Art and the artwork that seems to be in many of the Olivia books. There is a sweet set of board books for wee ones called ‘Mini Masters’ and we owned the Van Gogh and Monet ones. My favorite way for my son to appreciate art these days is the page a day calendar we have had two years running. We get to view something interesting every day and it’s been a great way for my son to remember the date (we homeschool and he is 6.5 now). Harold and the Purple Crayon–maybe not so much about art appreciation but it does really tell the story of art and imagination.